The company is one of the most reputed Turbidity Meter Manufacturers. Turbidity Meter provided by us is accurate and reliable. 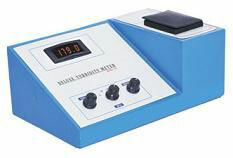 We provide Turbidity Meter for the measurement of suspended solids in the samples. We offer both nephelometers and Turbidity Meter for different applications. Digital Turbidity Meters is extremely useful for measurement of suspended solids in sewage water, ground water, potable water, soil analysis laboratories, fisheries and water quality control in boiler feed water, water works department, breweries, water purification plants, etc. Our design of Turbidity Meter is highly demanded by clients from chemical & pharmaceutical industries, etc.